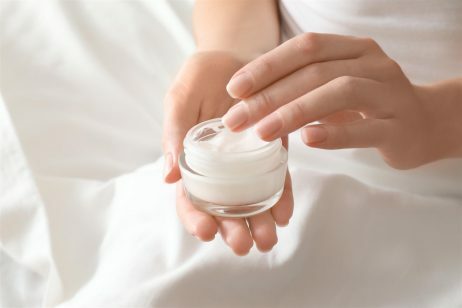 Glyceryl stearate is a naturally derived fatty acid that is used as a thickener, lubricating agent, and emollient in various cosmetics and personal care products. Glyceryl stearate, also called glycerol monostearate or GMS, can be found naturally in the human body. When it is synthetically produced, it is made by reacting glycerin with stearic acid, a natural fatty acid derived from palm kernel, vegetable, or soy oil. In fact, stearic acid is one of the most common saturated fatty acids found in nature. Glyceryl stearate is also a food additive that is primarily used in baking preparations. You may also see “glyceryl stearate SE” on product labels. Glyceryl stearate SE is a “Self-Emulsifying” form of glyceryl stearate that also contains a small amount of sodium and/or potassium stearate. According to Cosmetics Info, glyceryl stearate SE is produced by reacting an excess of stearic acid with glycerin. The excess stearic acid is then reacted with potassium and/or sodium hydroxide yielding a product that contains glyceryl stearate as well as potassium stearate and/or sodium stearate. Glyceryl stearate functions as a non-ionic opacifier, thickener, and formulation stabilizer, and also offers skin conditioning, moisturization, and hydration. 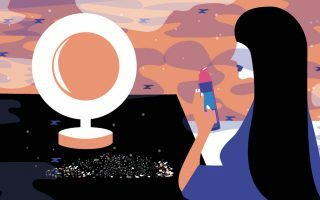 Since glyceryl stearate acts as an opacifier, this ingredient can be added to transparent or translucent cosmetic formulations to render them more resistant to visible light. Thus, companies will add glyceryl stearate to formulations to make them thick, smooth, and creamy. Glyceryl stearate is also used to stabilize products, decrease water evaporation, make products freeze-resistant, and prevent products from forming surface crusts. Additionally, glyceryl stearate reduces the greasiness of oils used in certain cosmetics and personal care products. Glyceryl stearate SE is an emulsifier with a HLB value of 5.8. HLB (Hydrophile-Lipophile Balance) is an empirical expression for the relationship of the hydrophilic (“water-loving”) and hydrophobic (“water-hating”) groups of a surfactant. An HLB of less than 10 means that the substance is soluble in oil. Thus, glyceryl stearate SE is useful for making water-in-oil emulsions and can also be used as a co-emulsifier and thickener for oil- in-water formulations. When glyceryl stearate is applied to the skin, it acts as a lubricant and gives the skin a soft, smooth appearance while adding hydration to the skin. These benefits are all thanks to the glycerol component of glyceryl stearate. Glycerin, also referred to as glycerol, is a natural alcohol and humectant that’s been used in skin care products for centuries, says Dr. Wendy Bollinger Bollag, cell physiologist. In research published in The Journal of Investigative Dermatology, she and co-author Dr. Xiangjian Zheng, demonstrate that glycerin helps skin to look and function better by helping skin cells mature properly. In fact, glycerin is not just a humectant but also an occlusive moisturizer as well. This means that while it pulls water from the environment to hydrate skin, it also forms an occlusive barrier on the skin’s surface after application. This helps to prevent water loss from the upper layers of skin. Thus, glyceryl stearate will keep skin hydrated, soft, and supple. According to skin care expert Paula Begoun, glycerin is compatible with all skin types because it has the ability to mimic what’s known as skin’s natural moisturizing factor (NMF). Restoring skin’s NMF is important because it becomes depleted with age and also after exposure to certain environmental factors. Glycerin is also involved in the transport and activity of aquaporins in our skin’s surface. Aquaporins are integral membrane proteins that serve as channels in the transfer of water, and in some cases, small solutes across the cell membrane to skin’s uppermost layers. They play a key role in maintaining skin’s moisture balance, keeping it feeling smooth and comfortable even in drier climates. The Food and Drug Administration (FDA) includes glyceryl stearate in its list of direct food additives affirmed as Generally Recognized As Safe (GRAS). The safety of glyceryl stearate and glyceryl stearate SE has been assessed by the Cosmetic Ingredient Review (CIR) Expert Panel. The CIR Expert Panel evaluated the scientific data and concluded that glyceryl stearate and glyceryl stearate SE were safe for use in cosmetics and personal care products.